Twister was started back in 1980 in a little shed at the back of Michael’s Grandmother’s house. 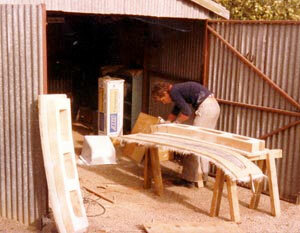 In this humble shed Michael worked for hours building prototype water skis. After extensive testing on water as well as on testing rigs, the first ski in the world to feature molded-in graphics was produced. The name of the ski was ‘Twister’. Before long the word spread and South Australian tournament skiers were desperate to ride the Twister ski. A few that rode the Twister included Craig Irons, Greg Zeishang and Simon Hill. First- it was the state record. Next- it achieved an Australian record. Moomba Masters Record (the first ski to complete the 35′ line length). Danny Kidder of Kidder Skis was so impressed he invited Michael to tour his factory in the USA showing him where to source the world’s best materials. Herb O’Brien of O’Brien and later HO was aware of this new ski from Australia and offered Michael his new range of HO skis to sell when he returned to Australia. Above is a photo of Michael hard at work in his Grandmother’s shed. Twister Ski Shop stocks many well known brands including Liquid Force, Masterline, O’Brien, Williams, Intensity, WOW, Testpilot, Sportsstuff, Jobe, Connelly, Moomba and Wing. Twister Ski Shop is currently located at 43 Audrey Ave, Blair Athol, SA 5084. Enter your details below to join our email mailing list and recieve the latest news on specials and products.